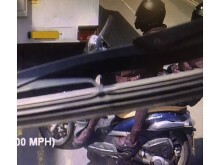 Detectives from the Flying Squad have released two CCTV images of moped riders they wish to speak to following the robbery of a cashbox during a cash in transit collection. On Thursday, 3 May, at approximately 12:00hrs, a cash delivery and collection was taking place at the Sainsbury’s on Hall Lane in Chingford. Two males riding a blue/silver scooter - with a stolen number plate - rode up to the custodian who was entering the store carrying a cashbox. The pillion passenger got off the scooter, ran at the guard and grabbed the cashbox. He then got back onto the rear of the scooter and the pair rode off in the direction of Haringey or Hackney. Detective Constable Tom Boow, from the Flying Squad, said: "The two suspects were wearing distinctive clothing, including matching dark purple puffer-style jackets, dark purple trousers, black and purple trainers and black helmets. Anyone with information is asked to call officers via 101 quoting reference 2877/3May or Crimestoppers anonymously on 0800 555 111.